The analysis of groundwater flow requires an understanding of the elements of fluid mechanics. Albertson and Simons (1964) provide a useful short review; Streeter (1962) and Vennard (1961) are standard texts. Our purpose here is simply to a standtroduce the basic fluid properties: mass density, weight density, compressibility, and viscosity; and to examine the concepts of fluid pressure and pressure head. An examination of the principles of fluid mechanics must begin with a review of the mechanics of materials in general. Table A1.1 provides a list of the basic mechanical properties of matter, together with their dimensions and units in the SI metric system. The SI system has as its basic dimensions: mass, length, and time; with basic SI units: kilogram (kg), meter (m), and second (s). All other properties are measured in units that are derived from this basic set. Some of these properties are so widely encountered, and their basic dimensions so complex, that special SI names have been coined for their derived units. As noted on Table A1.1, force and weight are measured in newtons (N), pressure and stress in N/m2 or pascals (Pa), and work and energy in joules (J). Table A1.2 provides an SI analysis of certain fluid properties and groundwater terms that occur in this text. Each is more fully described in Chapter 2. Much of the technology associated with groundwater resource development in North America is still married to the FPS (foot-pound-second) system of units. *b, thickness of confined aquifer (see Section 2.10). *A body whose mass is 1 lb mass (lbm) has a weight of 1 lb force (lbf). 1 lbf is the force required to accelerate a body of 1 lbm to an acceleration of g = 32.2 ft/s2. A slug is the unit of mass which, when acted upon by a force of 1 lbf, acquires an acceleration of 1 ft/s2. Table A1.3 provides a set of conversion factors for converting FPS units to SI units. For water, = 1.0 g/cm3 = 1000 kg/m3; γ = 9.8 × 103 N/m3. In the FPS system, γ = 62.4 lbf/ft3. The specific gravity G of any material is the ratio of its density (or specific weight) to that of water. For water, G = 1.0; for most soils and rocks, G ? 2.65.
where is the fluid density. The compressibility of a fluid reflects its stress-strain properties. Stress is the internal response of a material to an external pressure. For fluids, stress is imparted through the fluid pressure. Strain is a measure of the linear or volumetric deformation of a stressed material. For fluids, it takes the form of reduced volume (and increased density) under increasing fluid pressures. The compressibility of water β is fully discussed in Section 2.9. It is defined by Eq. (2.44). The density, viscosity, and compressibility of water are functions of temperature and pressure (Dorsey, 1940; Weast, 1972). In general, their variation is not great, and for the range of pressures and temperatures that occur in most ground-water applications, it is common to consider them as constants. At 15.5°C, = 1.0 g/cm3, μ = 1.124 cP, and β = 4.4 × 10–2 m2/N. The fluid pressure p at any point in a standing body of water is the force per unit area which acts at that point. Under hydrostatic conditions, the fluid pressure at a point reflects the weight of the column of water overlying a unit cross-sectional area around the point. It is possible to express pressure relative to absolute zero pressure, but more commonly it is expressed relative to atmospheric pressure. In the latter case it is called gage pressure, as this is the pressure reading that is obtained on gages zeroed to the atmosphere. In effect, the pressure head ψ is a measurement of the fluid pressure p.
Fluid pressures are also developed in groundwater as it flows through porous geological formations and soils. In Section 2.2, the elements of fluid mechanics presented in this appendix are applied in the development of groundwater flow theory. A rigorous development of the equation of flow for transient flow in saturated media must recognize the fact that transient changes in fluid pressure lead to deformations in the granular skeleton of a porous medium, and these deformations imply that the medium, as well as the water, is in motion. This realization creates the need for two refinements to the classical derivation presented by Jacob (1940) and followed in Section 2.11 of this text. First, as recognized by Biot (1955), it is necessary to cast Darcy’s law in terms of the relative velocity of fluid to grains. And second, as recognized by Cooper (1966), it is necessary to consider the conservation of mass for the medium as well as for the fluid in the elemental control volume. One can develop the continuity relationships in one of three ways: (1) by considering a deforming elemental volume in deforming coordinates, (2) by considering a deforming elemental volume in fixed coordinates, or (3) by considering a fixed elemental volume in fixed coordinates. Following Gambolati and Freeze (1973), we will use a fixed elemental volume in fixed coordinates. The approach requires the use of vector notation and the material derivative (total derivative, substantial derivative). If these concepts are not familiar, Aris (1962) and Wills (1958) provide introductory treatments. The development will be presented here for a homogeneous, isotropic medium with hydraulic conductivity K, porosity n, and vertical compressibility α. The same approach is easily adapted to heterogeneous and anisotropic media. where is the fluid velocity and the velocity of the deforming medium. Equation (A2.19) is identical to Eq. (2.75) developed by Jacob (1940). The more rigorous development makes it clear that the validity of the classical equation of flow rests on the satisfaction of the inequalities of Eqs. (A2.11) and (A2.12) and the stress condition of Eq. (A2.15). It is unlikely that these conditions are always satisfied. Gambolati (1973b) shows that where the rate of consolidation exceeds the rate of percolating fluid , as it can in thick clay layers of low permeability and high compressibility, the inequalities may not be satisfied. With regard to the stress condition, the , term at the end of Eq. (A2.13) is really the protruding tip of an iceberg that relates the three-dimensional flow field to the three-dimensional stress field. Biot (1941, 1955) first exposed the interrelationships and Verruijt (1969) provides a clear derivation. Schifiman et al. (1969) provides a comparison of the classical and Biot approaches, and Gambolati (1974) analyses the range of validity of the classical equation of flow. We will solve for h = (x, y) using the separation-of-variables technique. This equation is identical to Eq. (2.81), presented in Section 2.11 without proof. It is immediately clear that Eq. (A3.14) satisfies the boundary conditions of Eqs. (A3.3) and (A3.4). Differentiation with respect to y yields zero in satisfaction of Eq. (A3.2). Differentiation with respect to x twice also yields zero, so the solution Eq. (A3.14) satisfies the equation of flow [Eq. (A3.1)]. *Note that these sizes are rounded values for the effective size in water solution and are not the size of the simple ions, unhydrated. For a more detailed discussion, see the original paper from which these values were taken [J. Kielland, J. Amer. Chem. Soc., 59, 1675 (1973)]. BERNER, R. A. 1971. Principles of Chemical Sedimentology. McGraw-Hill, New York, 240 pp. KLOTZ, I. M. 1950. Chemical Thermodynamics. Prentice-Hall, Eaglewood Cliffs, N.J., 369 pp. MANOV, G. G., R. G. BATES, W. J HAMER, and S. F. ACREE. 1943. Values of the constants in the Debye-Hückel equation for activity coefficients. J. Amer. Chem. Soc., 65, pp. 1765–1767. On a digital computer it is impossible to take the limit as , but it is possible to approximate the limit by assigning to some arbitrarily small value; in fact, we can do so by designing a nodal network with a mesh spacing of . The abandoned terms of the Taylor expansion represent the truncation error in the finite-difference approximation. which is identical to Eq. (5.24). Tóth (1962, 1963) has presented two analytical solutions for the boundary-value problem representing steady-state flow in a vertical, two-dimensional, saturated, homogeneous, isotropic flow field bounded on top by a water table and on the other three sides by impermeable boundaries (the shaded cell of Figure 6.1, reproduced in an xz coordinate system in Figure A7.1). Figure A7.1 Region of flow for Tóth’s analytical solution. He first considered the case where the water-table configuration is a straight line of constant slope. For this case, the region of flow in Figure A7.1 is the region ABCEA. 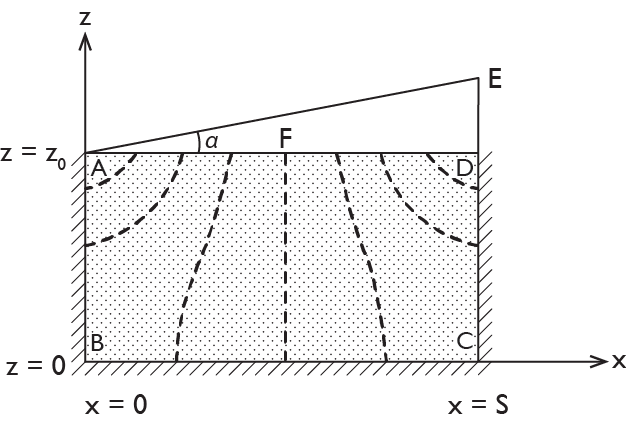 Since it is not possible to obtain an analytical solution in a trapezoidal region, Tóth approximated the actual region of flow by the shaded region ABCDA. He projected the hydraulic-head values that exist along the actual water table AE onto the upper boundary AD of the region of solution. The approximation is satisfactory for small α.
where c = tan α. This equation satisfies both the equation of flow (A7.1) and the boundary conditions (A7.2). When plotted and contoured, it leads to the equipotential net shown in Figure A7.1. Flow is from the recharge boundary DF through the field to the discharge boundary AF. where , , and , a’ being the amplitude of the sine curve and b’ being the frequency. The equipotential net described by this function is similar to that of Figure 6.2(b). at the base. The solution is in terms of the pressure head, . The position of the water table at any time is given by the value of z at which . The required input includes the initial conditions, , the rainfall rate R, the groundwater recharge rate Q, and the unsaturated characteristic curves K(ψ) and C(ψ). For , K = K0 and C = 0, being the air entry pressure head. where the values of , , and , which determine the K and C values to be applied for a particular node at a particular time step, are determined by extrapolation from previous time steps as described by Rubin and Steinhardt (1963). Similar finite-difference equations, which incorporate the boundary conditions (A8.2) and (A8.3), can be written for the nodes at the upper and lower boundary (j = 1, j = L). where the coefficients A, B, C, and D vary with the node (j = 1, j = 2 à L – 1, j = L), with the time step (n = 1, n = 2, n > 2), and with the saturation . The variables on which A, B, C, and D depend are the ψ values from the previous time step, the boundary values R and Q, and the functional relationships K(ψ) and C(ψ). The E and F coefficients are calculated from j = 1 to j = L, and the ψ’s are back-calculated from j = L to j = 1 using Eq. (A8.6). For j = 1, E1 = A1/B1 and F1 = D1/B1. Complications arise if the upper node j = L is saturated. If K(ψ) and C(ψ) are hysteretic, they are usually built into the computer program in the form of a table of values representing the main wetting, main drying, and principal scanning curves. The program must locate the correct curve on the basis of whether the node in question is wetting or drying, and by scanning the past history of the node to determine the ψ value at which a change from wetting to drying or vice versa occurred. If we divide through by T/Δx2, these coefficients are seen to be the same as those developed in a less rigorous way in Section 8.8 and presented in connection with Eq. (8.57). Trescott et al. (1976) have suggested that there is some advantage to utilizing the harmonic mean rather than the arithmetic mean in Eq. (A9.5). This approach changes the coefficients in the finite-difference equation but does not alter the concepts underlying the development. Equation (A9.9) is written in terms of the hydraulic head values at five nodes at time step k and one node at time step k – 1. It is known as a backward-difference approximation. Remson et al. (1971) note that there are some computational advantages to using a central-difference approximation, known as the Crank-Nicholson scheme, that utilizes head values at five nodes at time step k and five nodes at time step k – 1. The alternating-direction implicit procedure (ADIP) utilized by Pinder and Bredehoeft (1968) involves two finite-difference equations, one in the xt plane and one in the yt plane. Each uses head values at three nodes at time step k and three nodes at time step k – 1. The equation derived here is a statement of the law of conservation of mass. The derivation is based on those of Ogata (1970) and Bear (1972). It will be assumed that the porous medium is homogeneous and isotropic, that the medium is saturated, that the flow is steady-state, and that Darcy’s law applies. Under the Darcy assumption, the flow is described by the average linear velocity, which carries the dissolved substance by advection. If this were the only transport mechanism operative, nonreactive solutes being transported by the fluid would move as a plug. In reality, there is an additional mixing process, hydrodynamic dispersion (Section 2.13), which is caused by variations in the microscopic velocity within each pore channel and from one channel to another. If we wish to describe the transport process on a macroscopic scale using macroscopic parameters, yet take into account the effect of microscopic mixing, it is necessary to introduce a second mechanism of transport, in addition to advection, to account for hydrodynamic dispersion. To establish the mathematical statement of the conservations of mass, the solute flux into and out of a small elemental volume in the porous medium will be considered (Figure A10.1). In Cartesian coordinates the specific discharge v has components (vx, vy, vz) and the average linear velocity has components . The rate of advective transport is equal to . The concentration of the solute C is defined as the mass of solute per unit volume of solution. The mass of solute per unit volume of porous media is therefore nC. For a homogeneous medium, the porosity n is a constant, and . Figure A10.1 Mass balance in a cubic element in space. The form of the dispersive component embodied in Eq. (A10.2) is analogous to Fick’s first law. where l is the coordinate direction along the flowline, Dl the longitudinal coefficient of dispersion, and , the average linear velocity along the flowline. where Dl and Dt are the coefficients of dispersion in the longitudinal and transverse directions, respectively. Equations (A10.8) through (A10.13) represent six forms of the advection-dispersion equation for solute transport in saturated porous media. Equation (A10.11) is identical to Eq. (9.3) in Section 9.2. The solution to any one of these equations will provide the solute concentration C as a function of space and time. It will take the form C(x, y, z, t) for Eqs. (A10.8) and (A10.9); C(l, t) for Eq. (A10.11); and C(Sl, St, t) for Eqs. (A10.12) and (A10.13). There are many well known analytical solutions to the simpler forms of the transport equation. Equation (9.5) in Section 9.2 is an analytical solution to Eq. (A10.11), and Eq. (9.6) is an analytical solution to Eq. (A10.9). In most field situations, two- or three-dimensional analyses are required. In addition, the velocities are seldom uniform and the dispersivities are usually variable in space. For these conditions, numerical methods adapted for digital computers must be used to obtain solutions. The coefficient of dispersion in a three-dimensional, homogeneous, isotropic porous medium as expressed in Eq. (A10.12) is a second-order symmetrical tensor with nine components. Dl and Dt are the diagonal terms of the two-dimensional form. The directional properties of the dispersion coefficients are caused by the nature of the dispersive process in the longitudinal and transverse directions. If the medium is itself anisotropic, mathematical description of the dispersive process takes on much greater complexity. No analytical or numerical solutions are available for anisotropic systems. Only for isotropic media has the coefficient of dispersion been represented successfully by experimental methods. where b is the bulk mass density of the porous medium, n the porosity, and S the mass of chemical constituent adsorbed on a unit mass of the solid part of the porous medium. The first term of Eq. (A10.14) is the dispersion term, the second is the advection term, and the third is the reaction term. This form of the reaction term is considered in Section 9.2 in connection with Eqs. (9.9) through (9.13). Analytical solutions to Eq. (A10.14) are presented by Codell and Schreiber (in press). Figure 9.12 presents some sample solutions carried out by Pickens and Lennox (1976) using numerical methods.